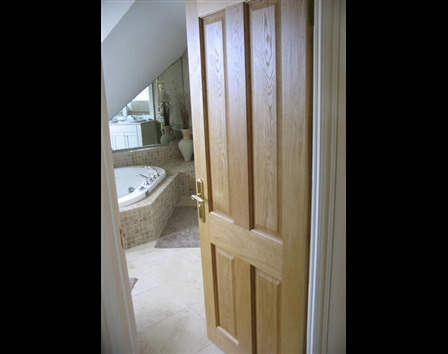 Our classic 4 panel internal oak door is a wonderfully versatile design, as well suited to smart modern interiors as Victorian or Edwardian properties. At 40mm thick it also has the look and feel of a traditionally handbuilt door, as well as added resistance to noise and is a far cry from the mass manufactured 'contract' doors. Our 4 panel internal oak door is available in a choice of standard sizes, which can be slightly adjusted if required, and can also be made as a bespoke internal oak door in any size up to 1000mm x 2100mm - perfect for listed buildings or other period properties with 'non standard' doorways. Choose from a sanded finish to be sealed in situ, or one of our signature, hand applied door finishes. Standard size doors are normally available from stock. Bespoke sizes normally have a lead time of around 12 weeks.